I wasn't surprised that Apple announced iPhoto '09 as part of its $79 iLife '09 suite of applications, but I didn't anticipate some of its new features. Others I did. In the "not too surprised" category, an enhanced Adjust panel was definitely in order. By most standards, iPhoto '08 wasn't providing the editing control that even some novices were looking for. That being said, the iPhoto '09 additions are still rather modest. A new Definition slider that allows us to bump up midtone contrast with a dash of sharpening is indeed welcome. It's one of my favorite sliders in Aperture, as well as its Adobe cousin, Clarity in Lightroom and Adobe Camera Raw. I'm not sure people will understand exactly what is going on with Definition, but I think they will like the results they see in their photos. 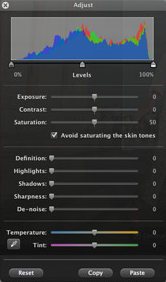 Instead of adding a Vibrancy slider, as we have in Aperture, iPhoto '09 instead gives us a checkbox labeled "avoid saturating the skin tones" for the Saturation slider. This is a user-friendly way to introduce the functionality that is essentially Vibrancy in Aperture. What remains to be seen, however, is the underlying algorithm in the iPhoto Saturation slider. Is it the old style "saturate everything evenly" or the more modern "increase the saturation more for less saturated hues" that we find in Vibrancy? If we get the new technology with the simplified slider adjustment, then this is definitely an improvement. Finally, adding "detect edges" to the Retouch Brush is another nice feature that makes it easier to make corrections with a round brush tip in an angular world. Much thanks! At the top of the "surprised" category is Faces. iPhoto uses face detection and face recognition technologies to help us organize our collections by people. It's similar to Events that lets us group by timestamp. We have to help iPhoto by providing confirmation when it groups a series of photos together. As we provide more feedback, it returns more possibilities, and becomes more precise. We can then use these collections in a variety of ways. This feature looks smart and well thought out. I can't wait to try it to see if it lives up to its potential. Places is the feature that I'm most excited about. Basically, it lets us organize our shots, and find them, based on location. If you have a GPS-enabled camera, such as an iPhone 3G, then iPhoto will use the coordinates added to the EXIF data to automatically assign the photo to a location. If you don't have such a camera, then you can instruct iPhoto to add the location data after the picture is loaded into the library. What's nice about Places is that you can easily find images based on their location. You can type an area you're searching for, and all of the corresponding photos appear. Or you can use the new column browser to narrow your search quickly, such as US, California, SF, Moscone Center. Once you see Places in action, I think you'll agree this is truly a useful tool. You can now upload directly to Facebook and Flickr from iPhoto, but you really could before via third party tools. So this is nice, but not ground breaking. The Themed Slideshows are also attractive. And the fact that you can create them in iPhoto and play them on your iPhone is a great idea. And I like the Travel Books feature too, that lets you show your trip on a map using the Places information. iPhoto is part of iLife, and you can buy the entire upgrade suite for $79. That's one of the best deals in software. You will need Leopard to run these applications however. Apple is easing that upgrade pain by offering the Mac Box Set for $229, and it includes the new iLife, new iWork, and Leopard Mac OS X. That's 40 percent off the price of them bought individually. I think iPhoto '09 will be a crowd pleaser. I would upgrade for Places alone, with the other goodies adding to the fun. Apple will begin shipping iLife '09 later this month. In the meantime, I'm going to start preparing to record an updated video tutorial on iPhoto '09 for Lynda.com later this month, and of course start working on the next iPhoto Missing Manual. The $229 is for the Family Pack Mac Box Set. For the single license version, the price of the Mac Box is only $169. Thanks Jim for that update! Yes, you can get the whole set of apps with updated OS for $169 for single user. Another new feature is the red-eye correction is automatic.